Directly swap out the OEM front chrome grille surrounds on the F90 M5 with the AutoTecknic's signature Glazing Black grille surrounds without having to purchase another complete set of grilles. 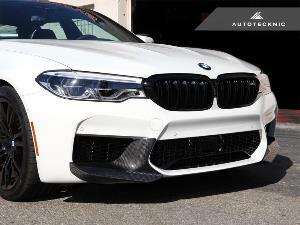 Developed and engineered with the OEM standard as the framework, all AutoTecknic front grilles are made with 100% non-recycled raw plastic that results in overall durable construction with strong clips and tabs for a secure and seamless fit. As an AutoTecknic standard, each outer ring surrounds are individually finished with the precision that yields a product of superior paint quality fit to accentuate any vehicle. Package includes one pair of passenger and driver side direct OEM replacement Glazing Black front grilles surrounds.